Join CAM for the opening of Above the Rim. The exhibition brings together fifteen international artists making work about the joy and community of basketball. First look at the exhibition. Above the Rim-inspired food + drinks. Meet the artists and Above the Rim Advisory Board. Sneak peek of one-of-a-kind basketball experiences and items. Experience Above the Rim and meet the artists. Food + Drinks + Dance Party featuring DJ Paradigm. The evening also celebrates the opening of Antoine Williams: Moral Monsters. CAM recommends parking at The Dillon, Uber, or Lyft. 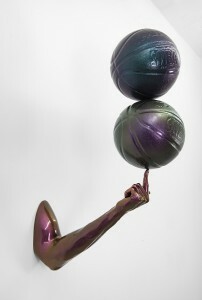 Hank Willis Thomas, Globe Trotter, 2016, fiberglass, chameleon auto paint finish, Photo Courtesy of The Jack Shainman Gallery, New York.